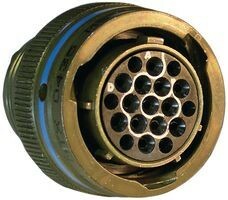 The MS3476W22-55S from Deutsch is MIL-DTL-26482 series II straight plug with 55 contacts. MIL-DTL-26482 series II connectors are available in different shell finishes with 48hr (unmated) and 452hr (mated) salt spray plating exposure. These connectors are designed for harsh environments and are excellent aerospace connectors with high quality contact retention system. It has a well-proven electrical capability and is designed to withstand extreme shock, exposure and vibration.